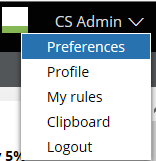 Starting with Pega Customer Service (formerly Customer Process Manager, or CPM) 6.3, the menu items in the user’s toolbar (for example: Channels, Logout, and so on) have been moved to a single drop-down menu under the User Name. Additionally, both the Phone and Chat toolbars are now separate and can also be selected under the user's name. Any site-specific overrides should be repeated in the latest version of the Rule-Navigation rule.